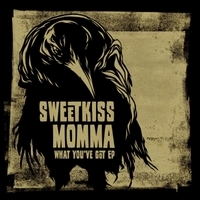 5 tracks of gritty goodness from Pacific NW roots rockers SweetKiss Momma. Proving that great Southern Rock comes as much from the soul as the place of birth, SweetKiss Momma (from Puyallup, WA, USA - just south of Seattle) has been releasing some of the most critically-acclaimed, and best-selling, independent American roots music over the last few years, skillfully blending their gritty NW origins with county, blues, and gospel to craft strikingly soulful rock-n-roll with a subtle Southern bend. In 2010, the band came screaming out of the blocks with their debut album ‘Revival Rock’. This “Rootsy, Southern-soul tinged, instant classic” (GreatIndieMusic.com - USA) garnered worldwide attention for the band, and went on to become one of the top selling independent albums of 2010 via music distributor CD Baby. With 2014’s ‘A Reckonig Is Coming’ SKM picked up right where they left off, earning the nod as the “Album of the Year” from The Weekly Volcano. On the strength of the sophomore effort, the band saw their stock rise overseas, and were able to embark on a successful European tour in early 2015, and have another swing through Europe planned for Spring of 2016. Though the band has seen a number of member changes through the years, the one constant has been front man Jeff Hamel. An award winning songwriter and singer, Hamel attributes his soulful delivery and the southern element in his writing to an upbringing spent playing gospel and spirituals in a local church. For SweetKiss Momma’s latest offering "What You've got", Hamel has teamed up with Pacific Northwest legends The Moss Brothers Band as his supporting musicians for a collection of songs that draw heavily on both SKM’s gritty riffage, and The Moss Bros. swampy heritage (the MBB as they are known, is made up of southern Alabama born-and-raised brothers Jeff and Troy Moss on guitars and vocals, bassist Kevin Dale, and drummer Zach Cooper), producing a collection of songs only possible with such a perfect marriage of styles.